Hiroshi got a slipped disk due to a back injury. He was taken to an Este salon by a mysterious beautiful girl who appeared suddenly, to receive a free trial of beauty treatment as well as a massage. When Hiroshi returned home after a beauty treatment, he was surprised to see himself in the form of a robot. Shinnosuke gets overjoyed, whereas Misae gets worried on seeing him as a naked robot. The robot version of Hiroshi turns out to be convenient. The robot Hiroshi could be controlled by a remote control and pretty much do anything including cooking and cleaning. Meanwhile, Hiroshi realizes that his turning into a robot has to do something with that Este salon. However, this new change was a dark conspiracy hatched by “Chichi Yure Doumei (The Association of Fathers)” to create a strong father figure for all the fathers in Japan. Soon, many dads in the whole nation go out of control, and the Nohara family (Shinnosuke's family) and Kasukabe start falling apart. Before the near-collapse of Kasukabe, Shinnosuke and Hiroshi i.e. Robot dad stand up to save the day. Featuring the most intense battle of middle-aged men, the movie brings a touching story that makes all fathers and families in Japan cry. 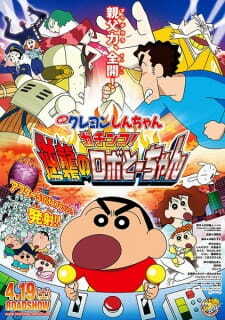 Prequel: Crayon Shin-chan Movie 21: Bakauma! B-Kyuu Gourmet Survival Battle!! As a die-hard fan of the Crayon Shin-chan movies, this movie generated more gross sobbing out of me. For those who have been following the series, or rather the movies, it really is not hard to see that Shin-chan's dad, Hiroshi, is a great father. He's the Japanese equivalent of Homer Simpson; not particularly talented, not very special or spectacular, but is a hard-working man who would give anything for his family. He may not be the best person, but he is a great father. He is the one who brings the tear out of the viewers during the movies through his expression of fatherly love. This movie, which is all about Hiroshi, touched on two topics: the eternal "what if I was a clone?" and the just the topic of a father itself. The ending was fairly obvious and easy to predict. However, the fact that robot Hiroshi, a father who values his family more than anything, had to let go of his family was heartbreaking. The last scene where he speechlessly challenged the human Hiroshi to an arm wrestle at the verge of his death drilled a hole in my heart. Even though he was finally accepted by his wife, his family, in the end, he was still just a robot. This fact was all the more painful to take because of how well the loyal viewers have seen what Hiroshi had gone through as the father of the Nohara family. This movie was not as adventurous as the rest of the Shin-chan movies, but it certainly did its job in showing the audience about Hiroshi and his position as a father. Even though the plot line of his creation was not very impacting, I personally think it made it easier for the story to be focused more on Hiroshi and less on the adventure aspect of the series.